When I was pregnant with Baby Bird I made a big list of al of the places in Canada that had a baby program. Places where I could go to find samples, coupons, reading materials and other items that a new parent would need. I was so excited to see that Shopper’s Drug Mart has recently come out with a fantastic program of their own that I can add to my list. Its so easy to sign up to be a part of this program. All you have to do is go to the Shopper’s Drug Mart website and fill out their form. You will need a Shoppers Optimum Card Number to sign up. Once you sign up, if you are expecting, you will receive a package in the mail with some travel sized samples of known brand-name baby products such as Johnson’s, Aveeno and Huggies. 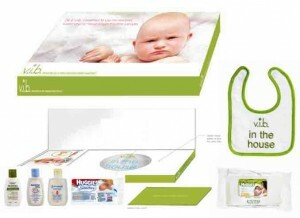 Also included in the packageis a bib and some great Shoppers Optimum point coupons for various baby products. Every member who signs up will receive relevant tips, hot deals and exclusive Optimum offers. You will also receive a birthday card when your new baby turns one with further offers. And if that wasn’t enough to get you to sign up, Shopper’s has a contest going onfor new vib sign-ups. Sign up to be a v.i.b. member between November 3rd and December 1st and you could win 1 of 50, $50 Shopper’s Drug Mart gift cards! PLUS as a new member you’ll receive 2500 points the next time you purchase any Pampers diaper products. I received the v.i.b. package to review and I love it. This would have been fantastic to have when we were expecting Baby Bird. Disclosure – I am participating in the Shoppers Drug Mart v.i.b program by Mom Central on behalf of Shoppers Drug Mart. I received a gift card and a new baby gift pack as a thank you for my participation. The opinions on this blog are my own. I’l keep my fingers crossed. Hey Jenny, I mentioned in my post, but just a note — with this program, you will only receive the gift if you are currently expecting and indicate that you are on the form.